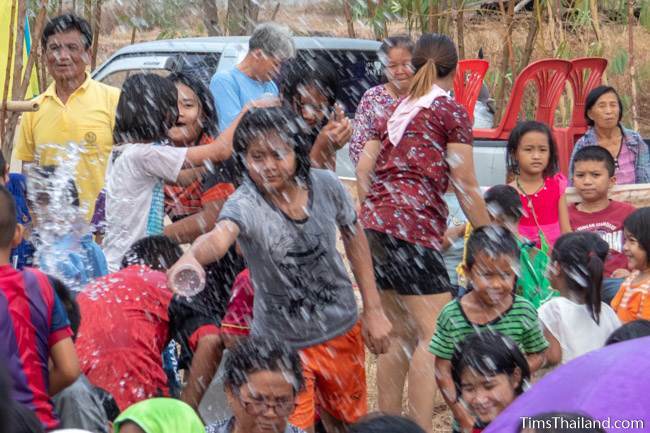 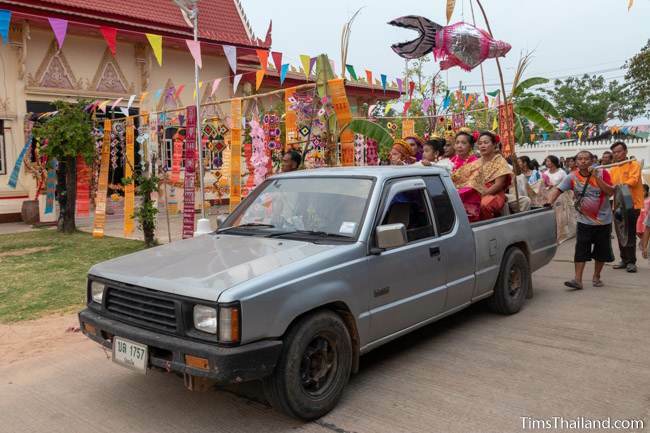 These photos are from the Boon Pha Wet (บุญผะเหวด) festival in Ban Lan, Amphoe Ban Phai, Khon Kaen province taken on March 26-28, 2019. 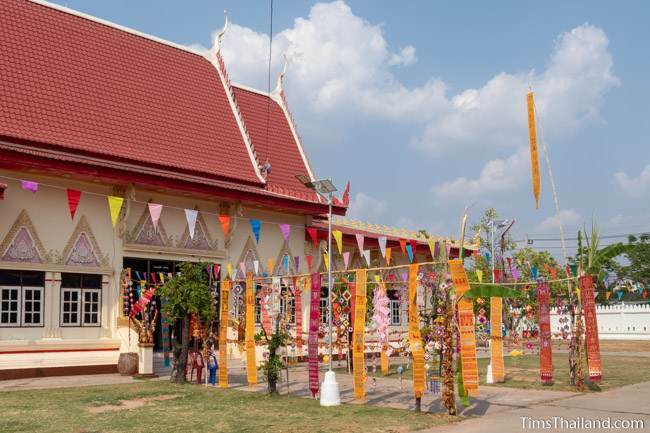 Thanks to everybody we met at the temple, especially Phra Tao, Paw Jan Sanit Khemla, and P' Kruea for answering so many questions. 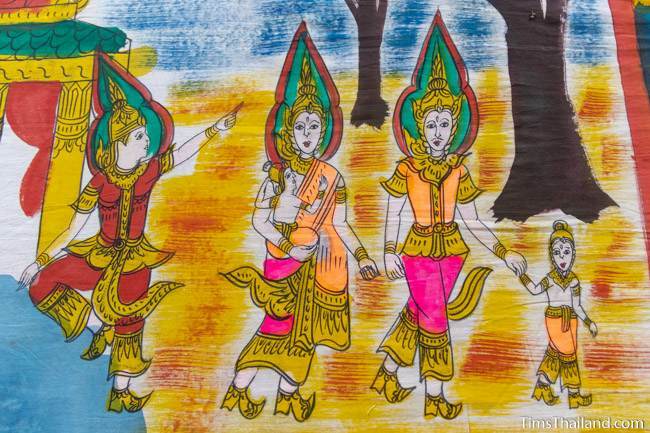 For more information, there's an explanation of Boon Pha Wet, a short version of the Vessantara Jataka (wetsandon chadok in Thai) folktale from the Pali Canon that most of the next two days revolves around, and an overview of heet sip-song, the twelve Isan merit-making traditions. 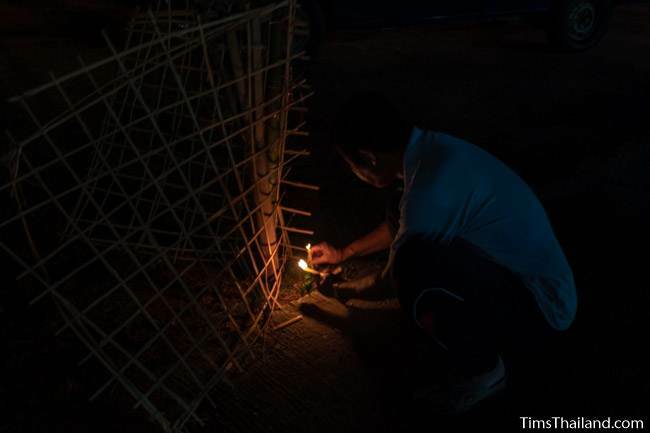 Most of the preparation was done the day before the festival began. 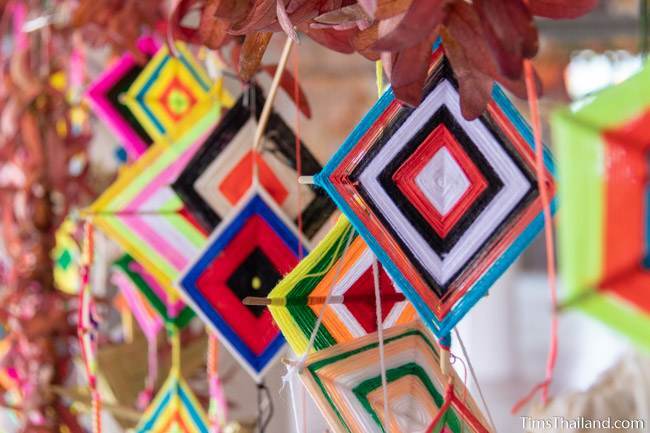 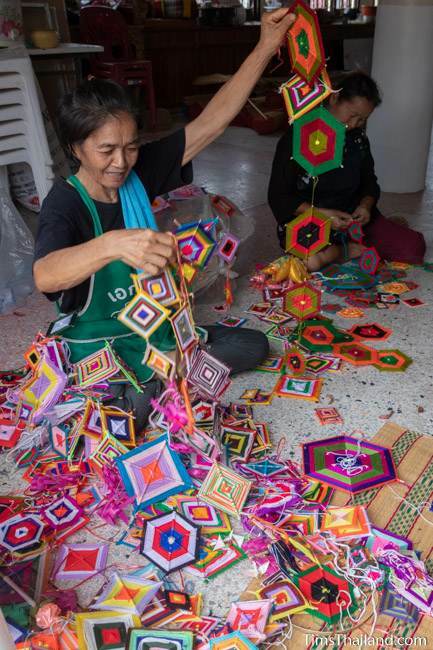 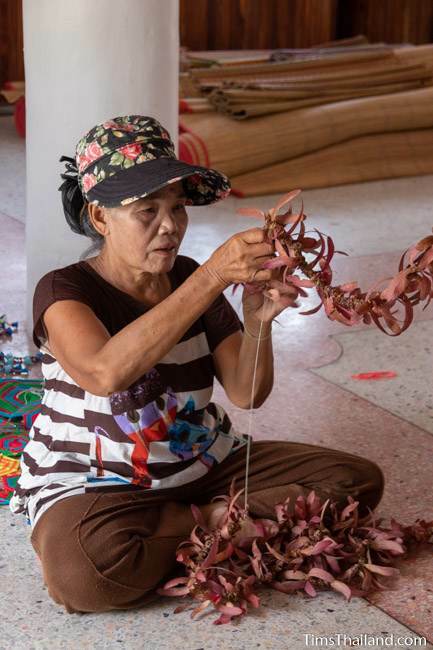 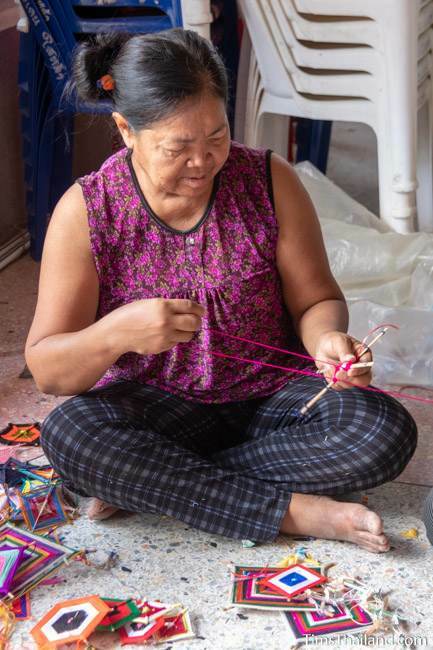 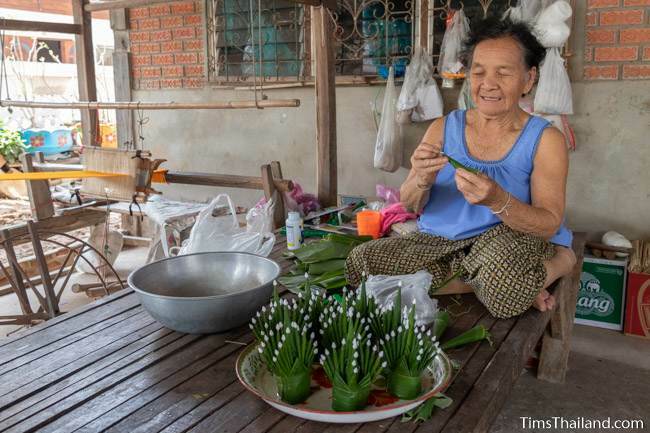 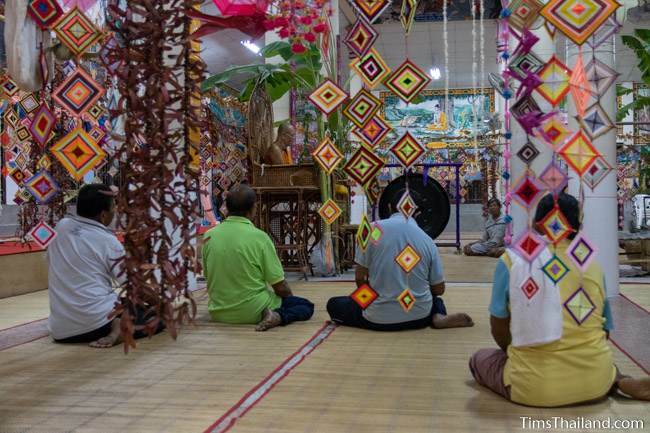 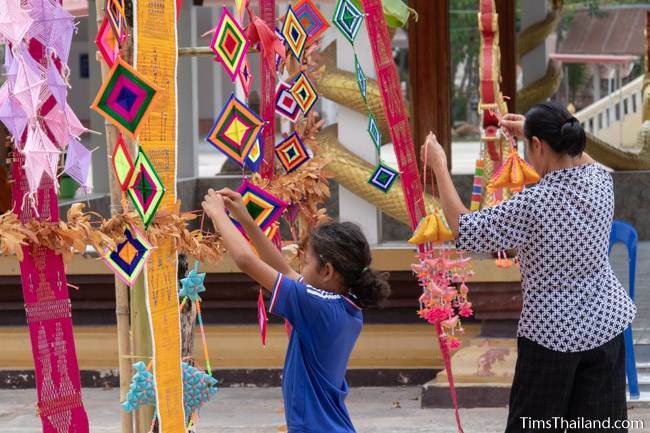 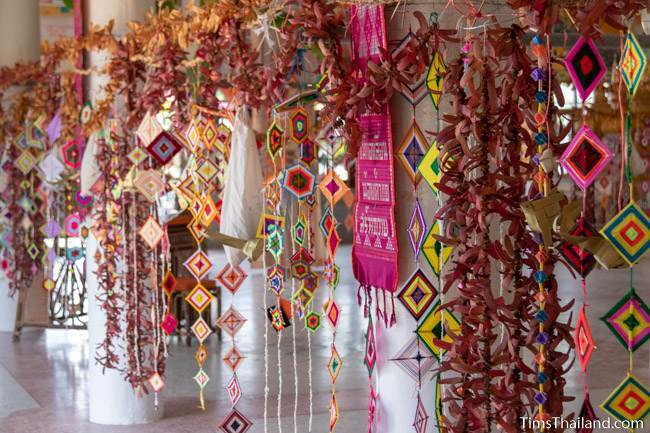 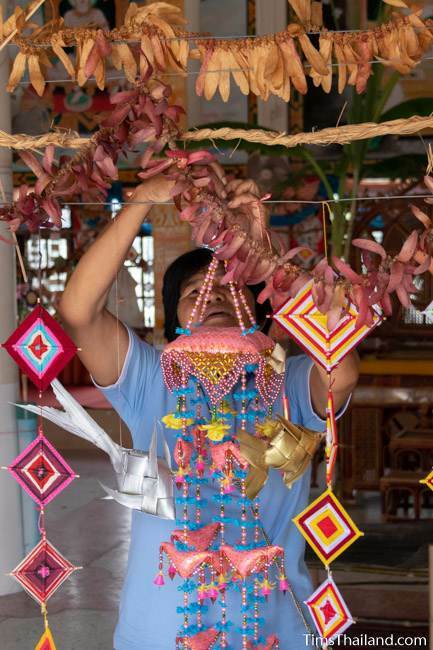 Wat Ban Lan temple's wihan was decorated inside and out with things like fish, birds, and flowers woven from palm leaf or plastic; garlands strung from tree seeds and grass; and most of all, Isan's iconic yai maeng mum crafted with colorful yarn. 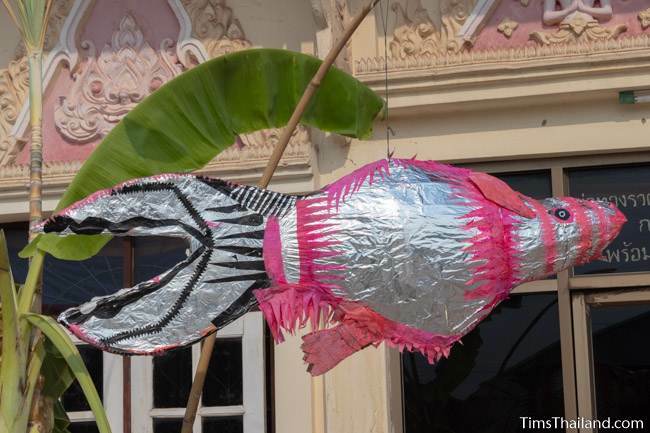 Most of these were reused from previous years, but some were made new. 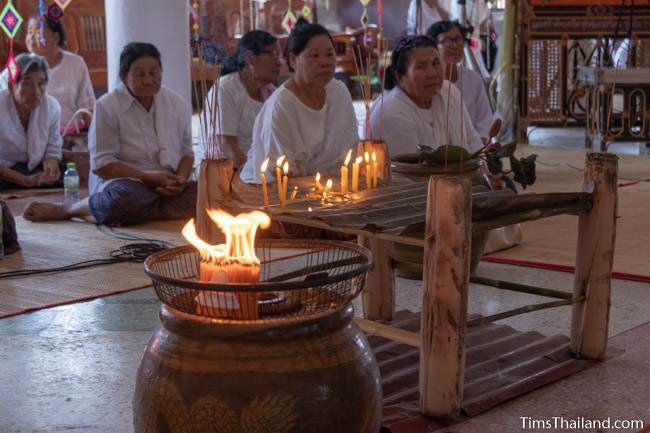 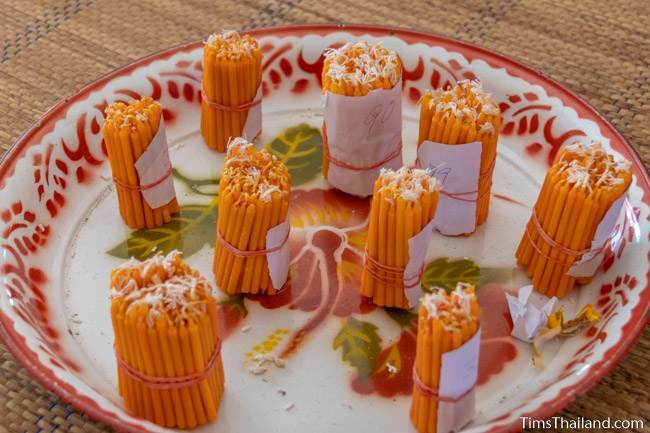 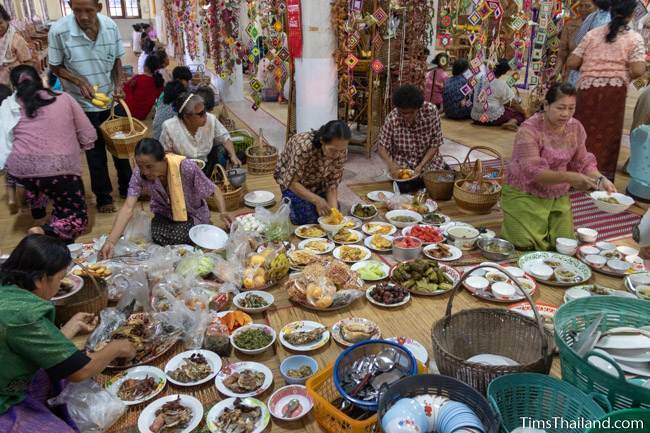 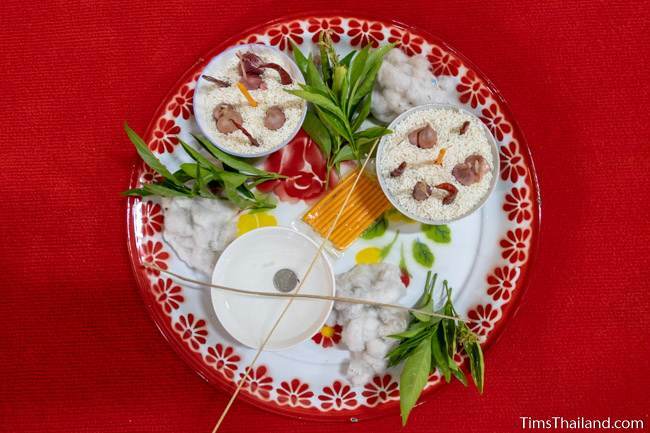 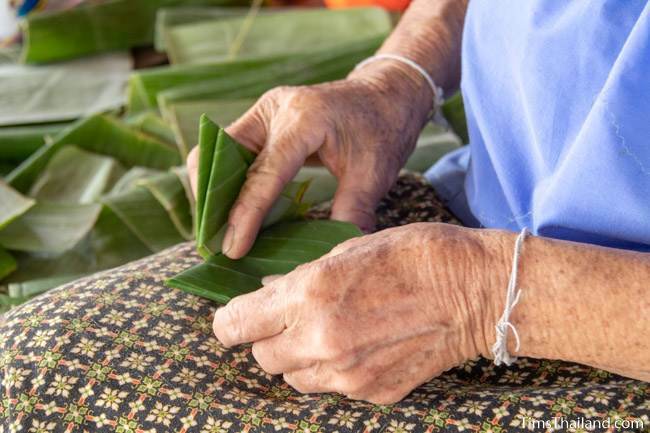 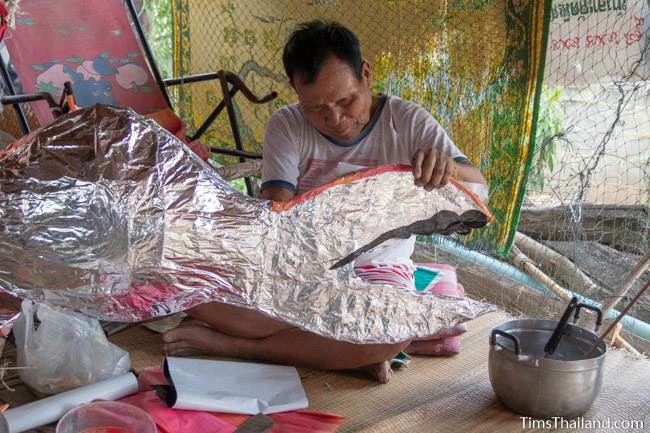 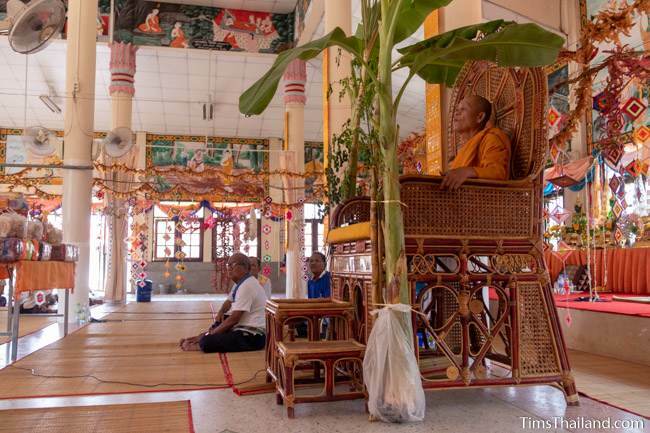 Other things to be used during various ceremonies over the two-day celebration, like kam mak-beng (made of folded banana leaves like a little bai-sii) and food that are given to monks, were prepared at home. 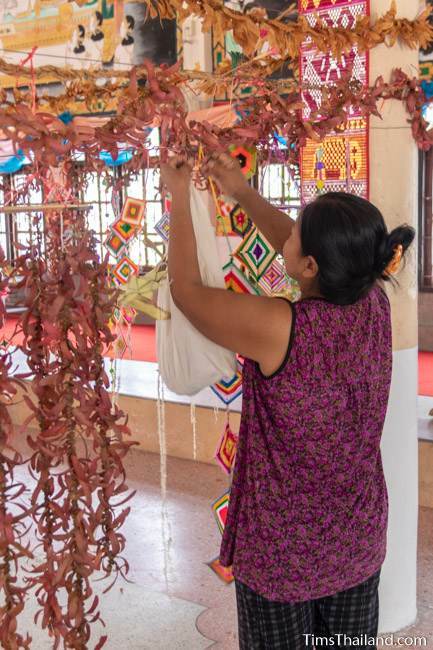 Hanging amidst the wihan's ornamentation were thirteen white bags (one for each "chapter" of the story) holding one thousand (for each of the poetic stanzas) candles, cigarettes, betel packs, and dtam miang. 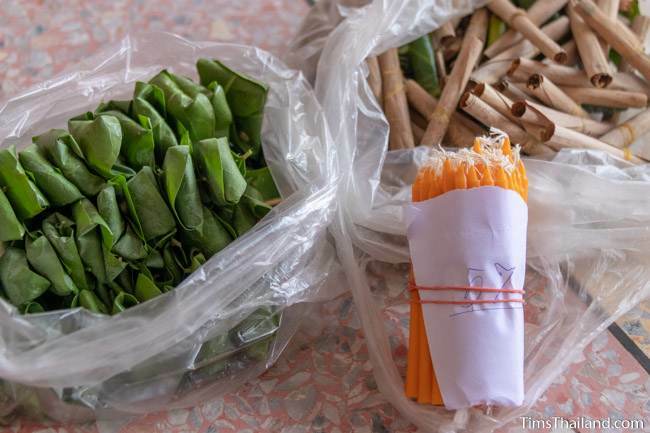 The latter are snacks made of noni fruit, green banana, young galangal stalk, fermented fish sauce (bplaa-raa), chili, sugar, and sour tamarind all pounded like som tam and then wrapped in star gooseberry leaves. 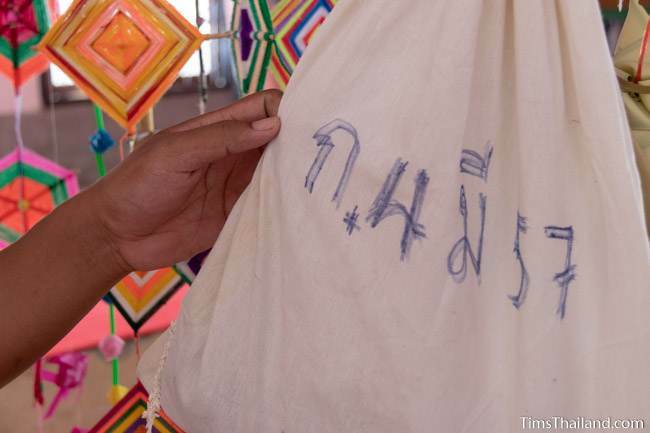 The number of each item in each bag matches the number of stanzas in that chapter. 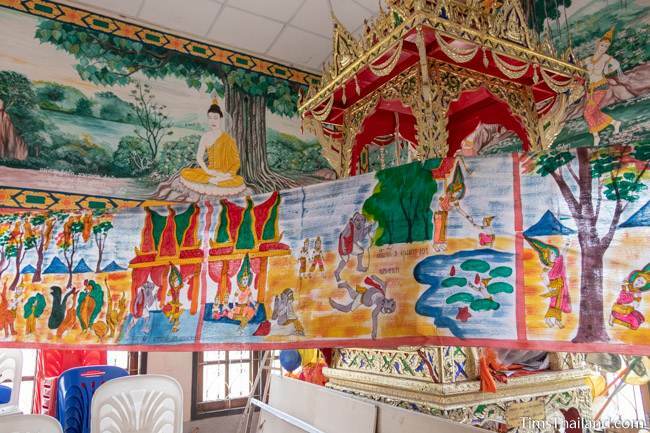 Also hung in the wihan was a Pha Wet banner (visually telling the complete Vessantara Jataka story) painted just a few years ago. 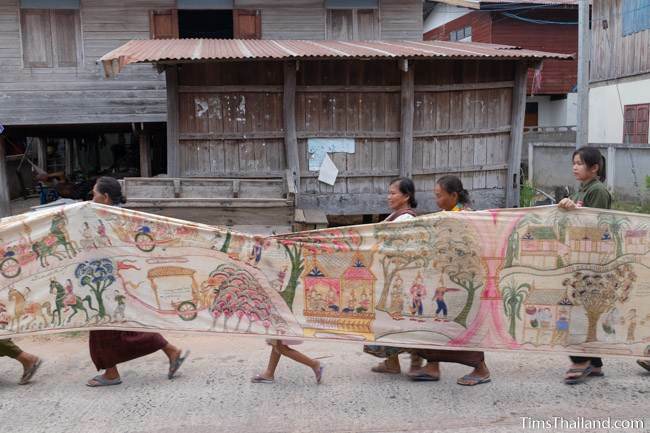 The temple's other older (1963) banner is only used for the actual ceremony. 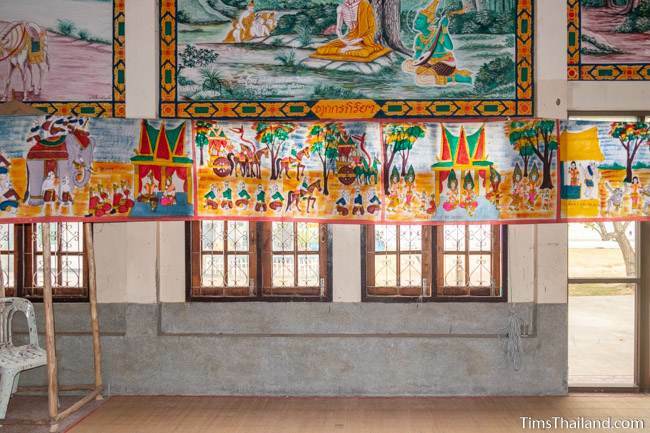 Slideshows of both banners are at the bottom of this page. 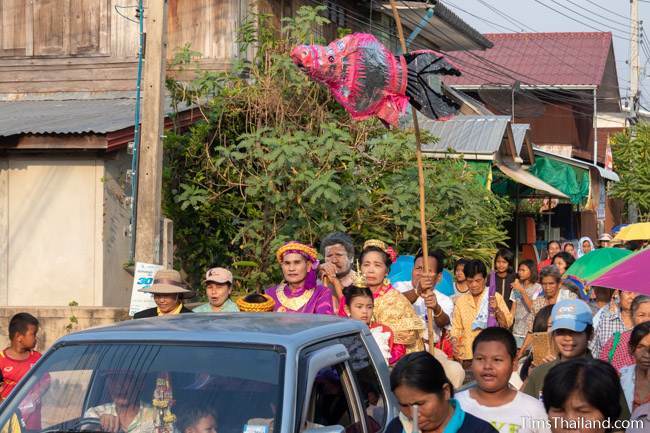 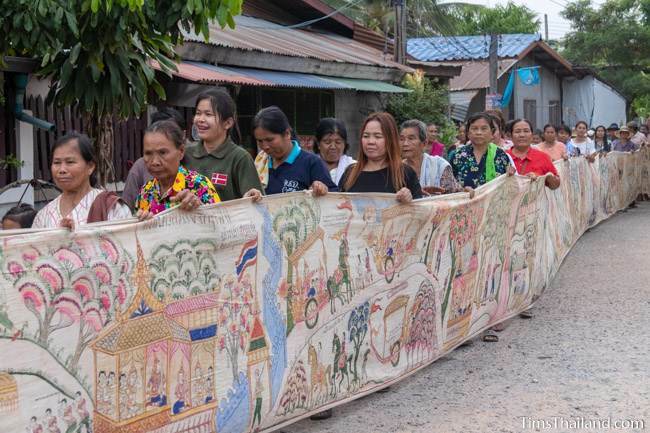 Boon Pha Wet kicks off with a parade, and seemingly the whole village gathered at the temple to be a part of it. 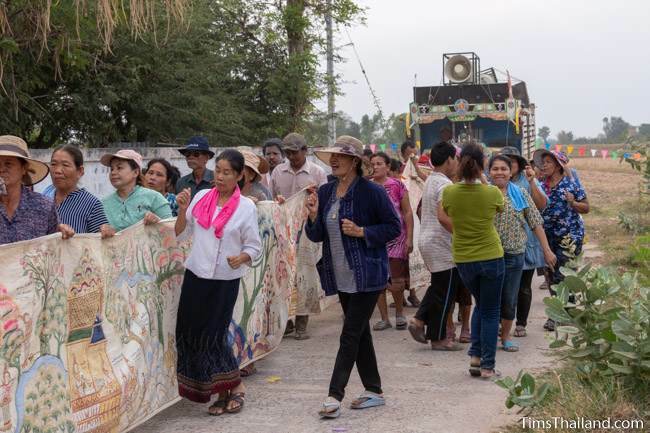 Starting late (4.45pm) to avoid the worst of the heat, everyone headed through the village and out to the rice fields where a small hill stood in for the wilderness where Prince Vessantara lived with his wife during his exile. 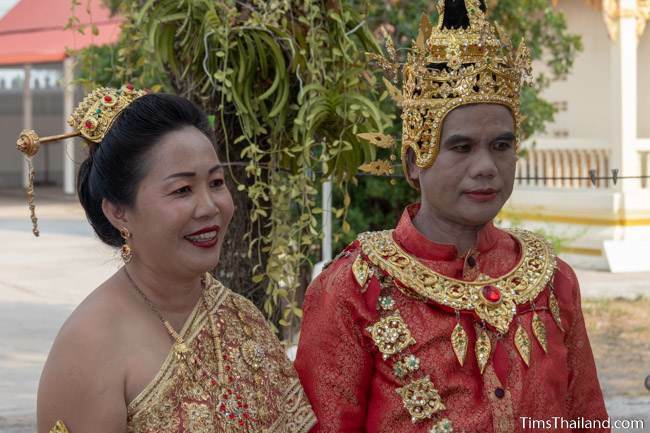 As happens in the story, everybody from the town goes out to this "forest" – where a couple dressed as the prince and his wife are waiting – to invite them back home. 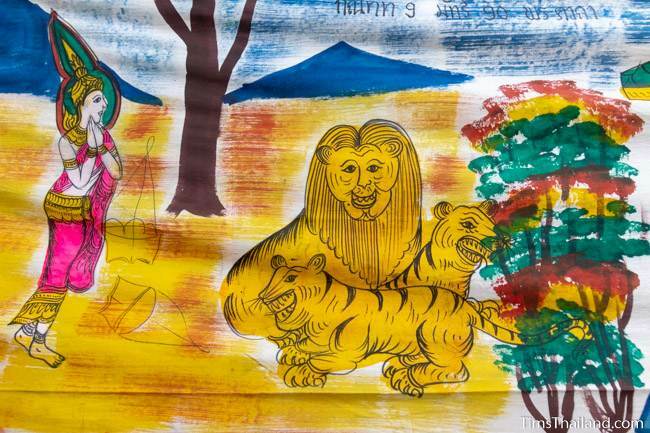 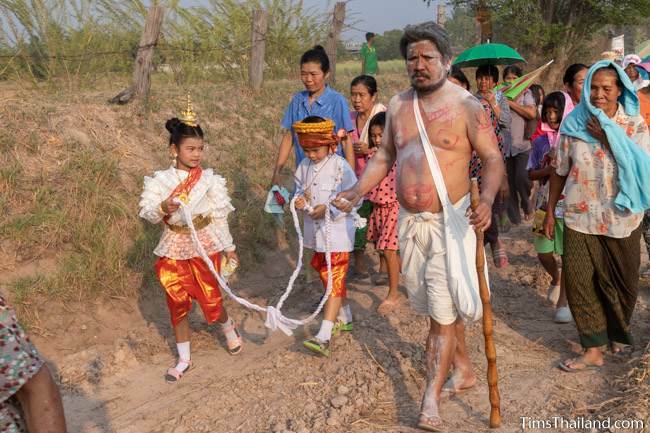 There are also people playing the prince's two children; his parents, the king and queen; and the evil brahmin Jujaka (Chuchok in Thai) who took the children to be his slaves. 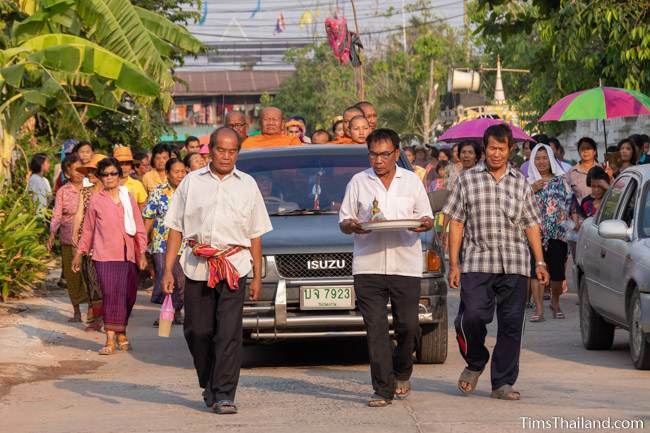 Three village elders and a small Buddha image led the way and, of course, a truck full of speakers blasting luuk thung (Isan country) music brought up the back. 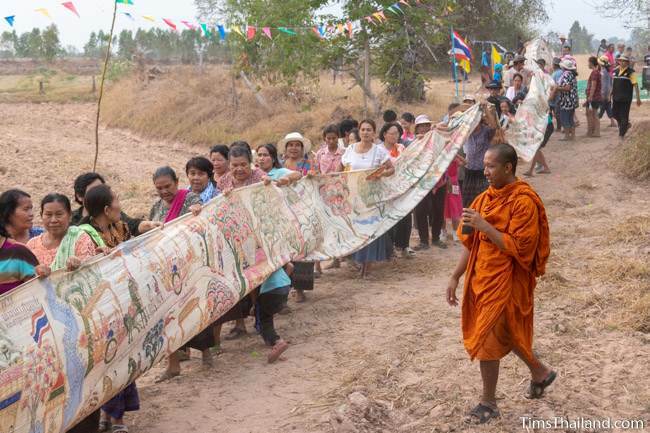 The ceremony in the "forest" took place surrounded by the temple's 40-meter-long vintage Pha Wet banner. 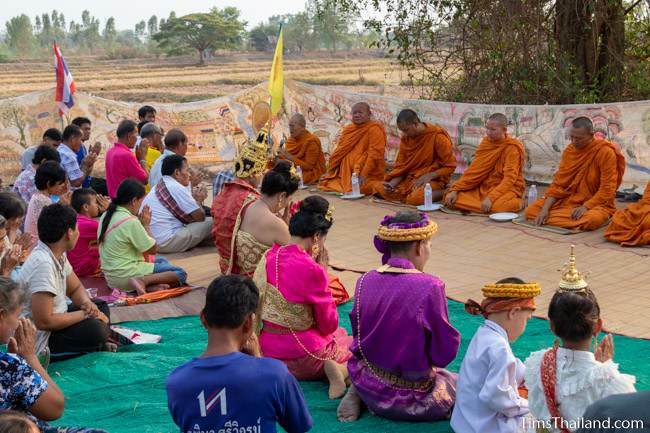 The monks began with prayers and then village elders led a partial reenactment of the Jataka tale's finale (where Prince Vessantara forgives his father, the family is reunited, and the kingdom prospers) and spoke about the importance of family. 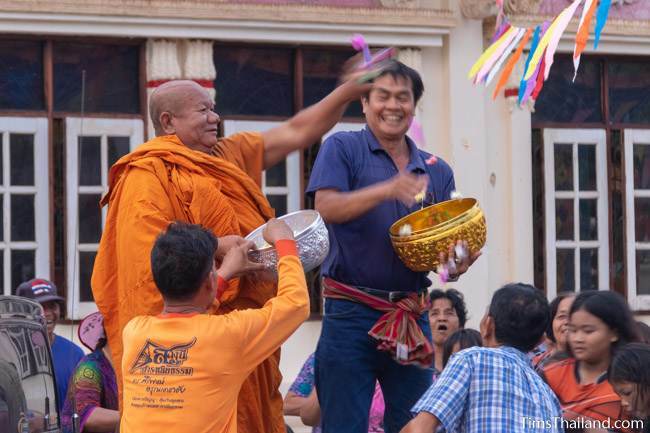 The moral of the Vessantara Jataka tale is generosity (Prince Vessantara perfected it, a necessary step towards becoming a Buddha) and this was in part represented by throwing beautifully wrapped coins into the crowd. 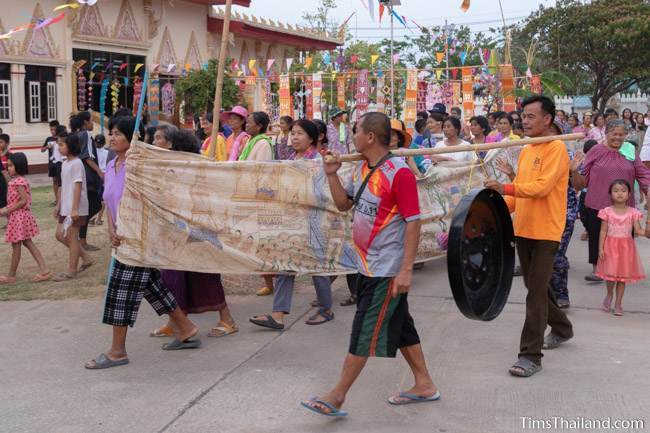 The banner was carried back to the temple unfurled, held up by about eighty people, and taken around the wihan three times. 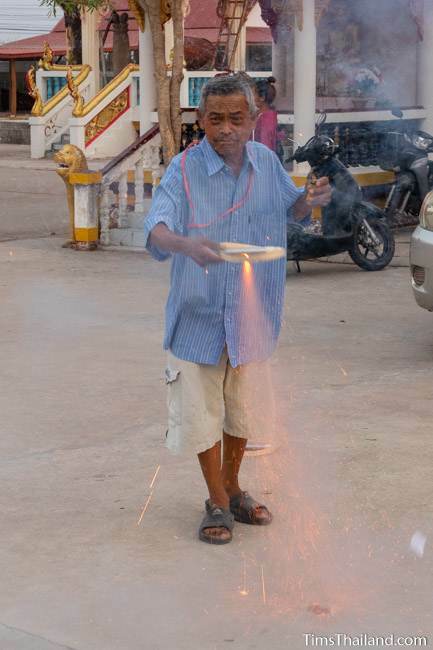 It was a festive procession with dancing, shooting fireworks, and more coin tossing. 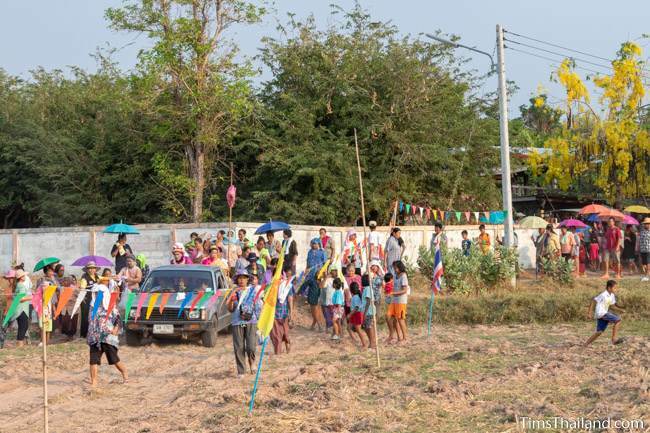 The parade over, most people went home, but a couple dozen stayed around the temple that evening. 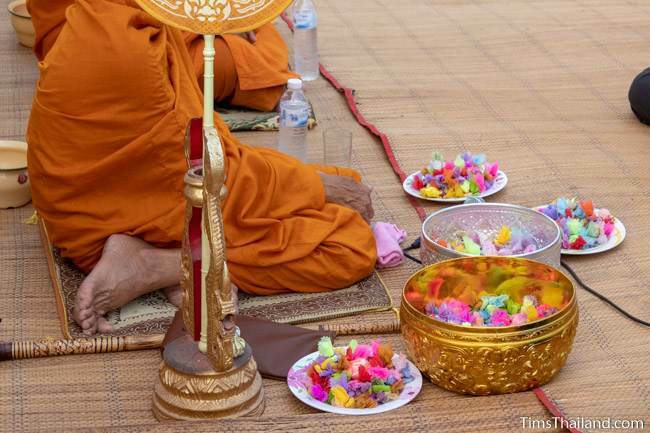 A mung-kun offering (the tray held rice, water, a five-baht coin, cotton, candles, chilis, shallots, and leaves from a snake jasmine shrub) was placed in front of a Buddha image, followed by the usual praying and chanting with the monks. 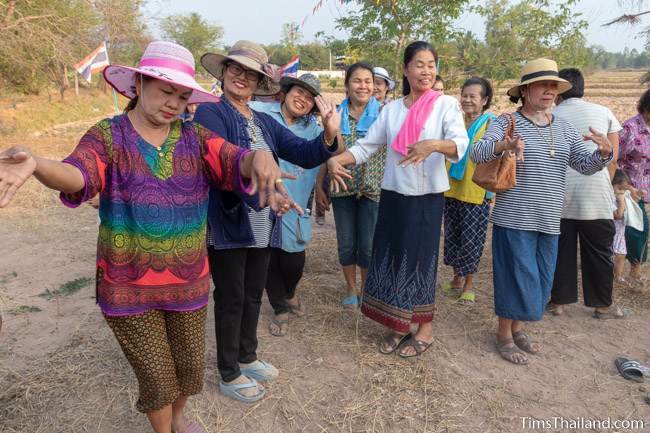 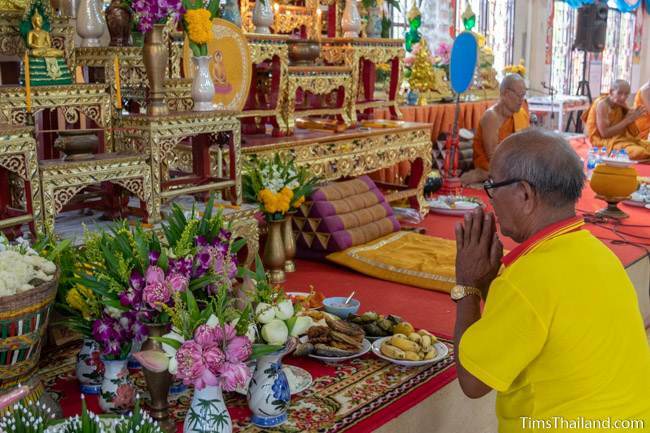 Then the village elders invited gods from heaven (they normally also invite Phra Upakut, but did not do that ceremony this year) to join and protect the celebration from bad spirits or other wicked things. 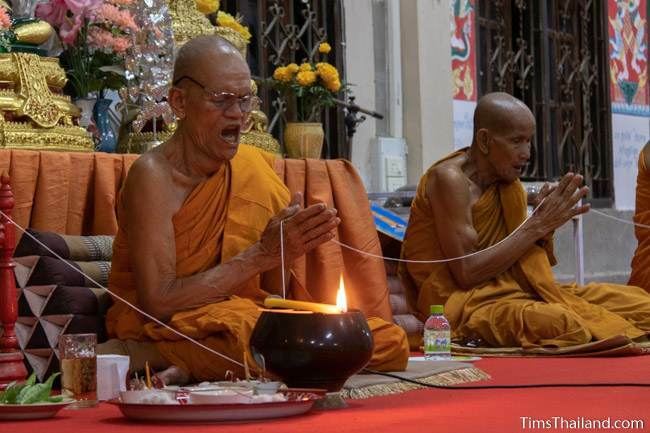 The evening's main event was one of the monks telling the tale of the time the mystical monk Phra Malai visited heaven and hell. 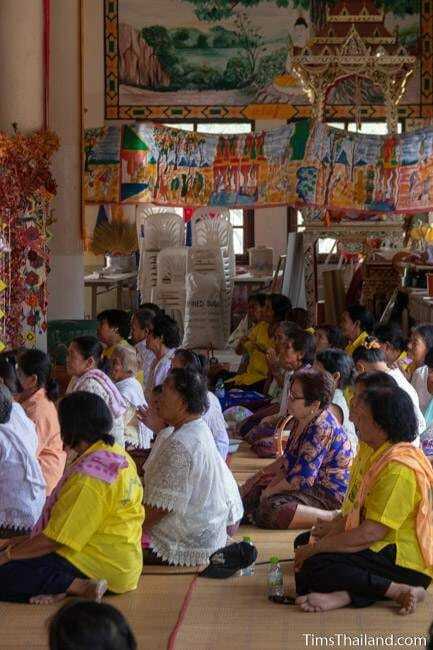 In the former he met Maitreya (the next Buddha) who explained that two of the things people should do if they want to be reborn during his time on earth are listening to the Vessantara Jataka told in one sitting and donating one thousand of something to the temple on that same day – and this advice is the reason that Boon Pha Wet exists. 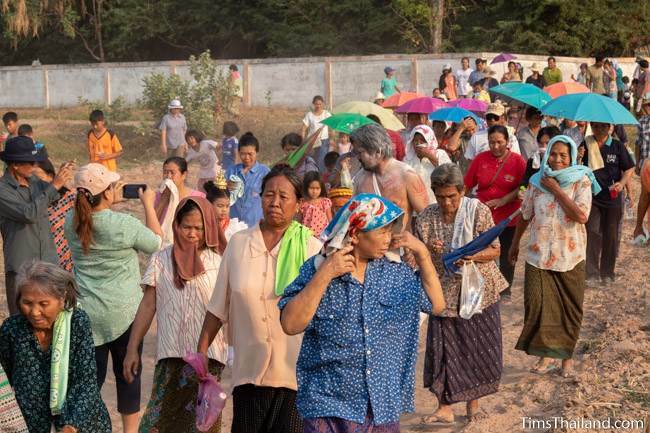 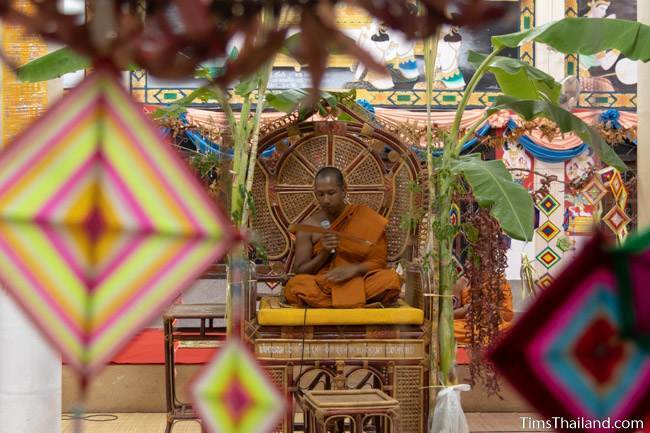 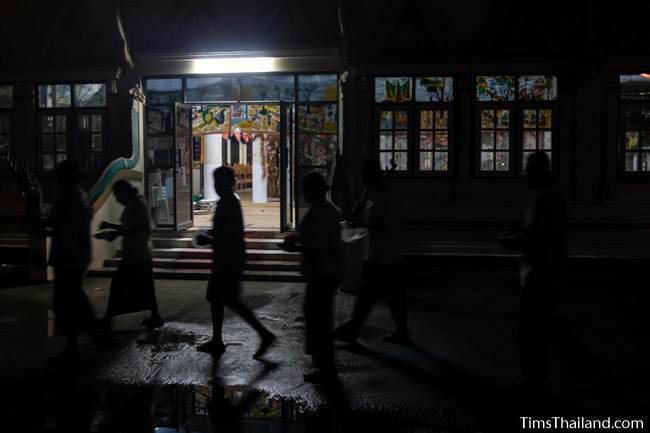 The second day of Boon Pha Wet began before sunup when a few early-risers came to the temple to do a khao pan gawn procession, which is both a show of respect to the Tripiṭaka (Buddha, dharma, sangha) and a plea for a good rainy season. 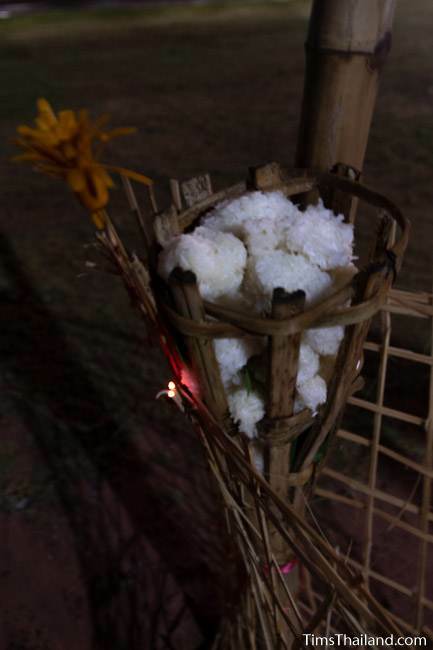 Candles were lit and baskets placed at each corner of the wihan. 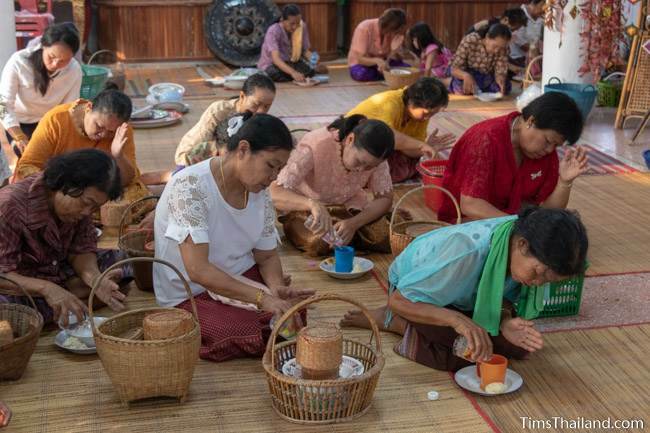 After saying a prayer, people circled the building three times, placing a sticky rice ball in each basket each time. 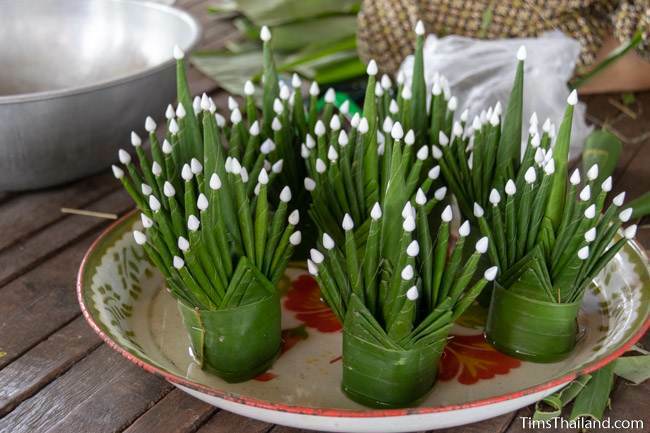 (In many villages people do one thousand sticky rice balls for this ceremony.) 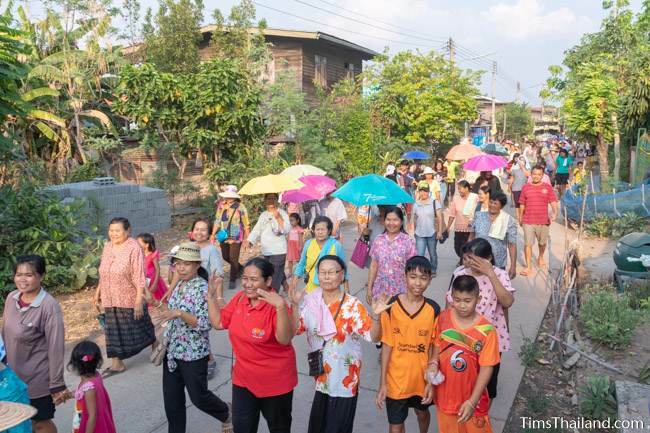 While walking they also sang a song about rain that including yelling out "jok, jok, jok" to imitate the howl of foxes because (if you use your imagination) this sounds similar to the sound of rainfall. 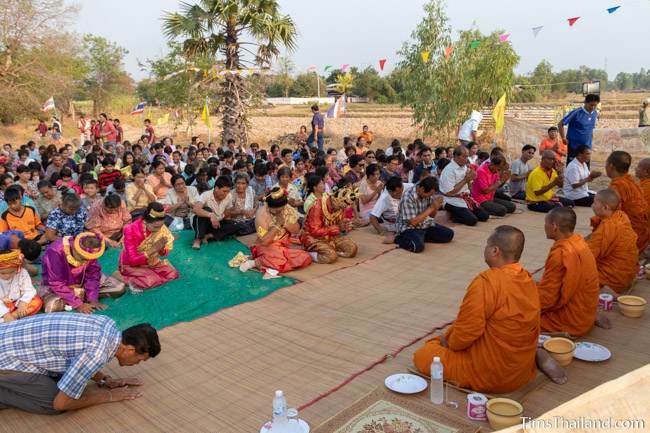 After three times around, the people listened to the abbot speak about dharma and some of the events in the Buddha's life, such as the demon Mara sending his three gorgeous young daughters to try to seduce the Buddha, but they turned old and ugly when they failed. 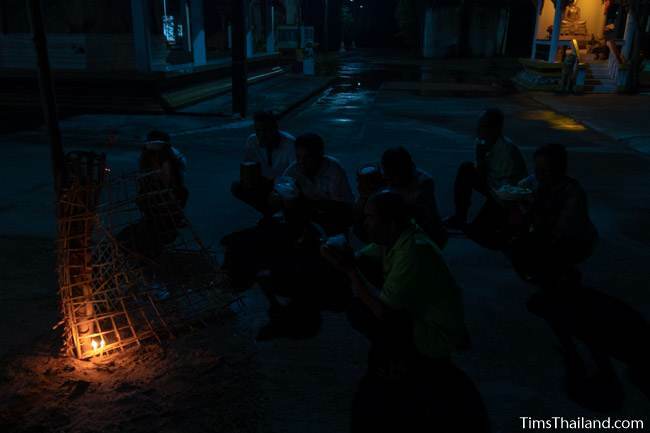 This pre-dawn ritual was followed by a more-or-less typical temple morning of prayers and eating in the wihan, only with many more people and a lot more food than usual. 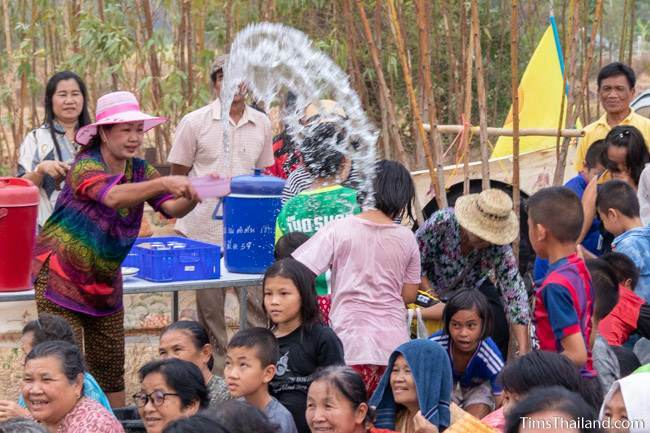 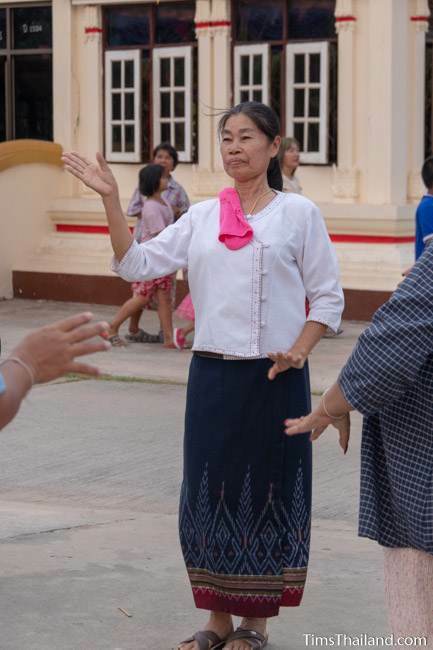 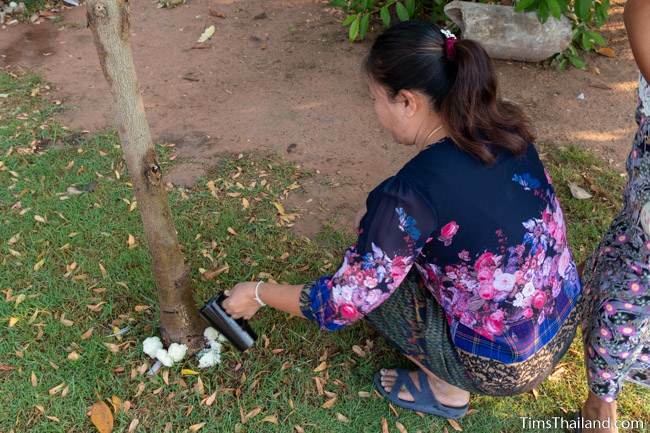 The last act was a gruat nam ceremony (people passing merit to their ancestors), which in this village includes giving a ball of sticky rice along with the holy water. 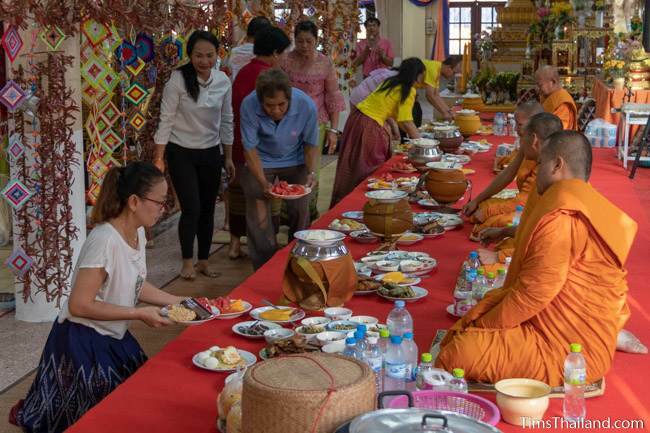 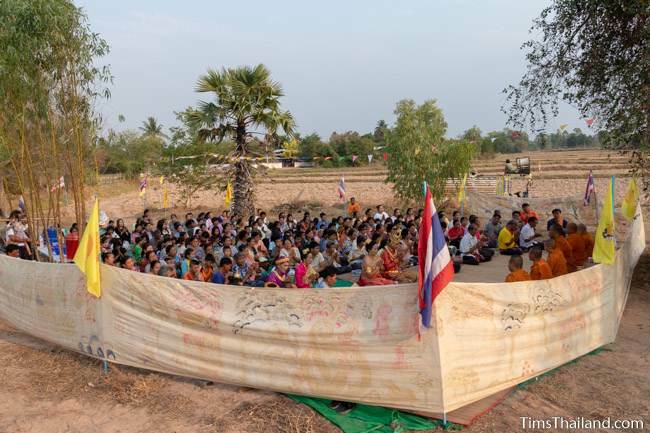 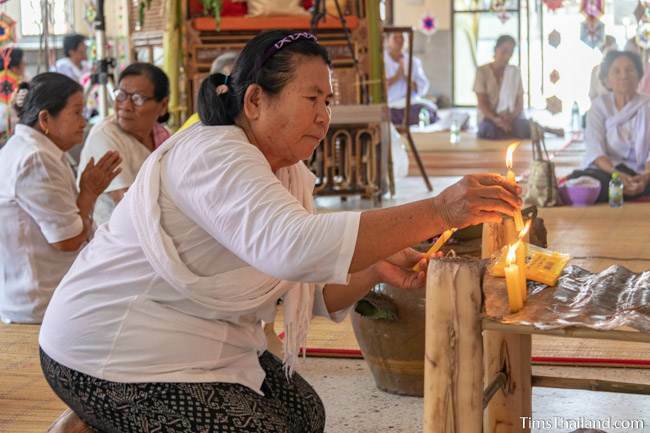 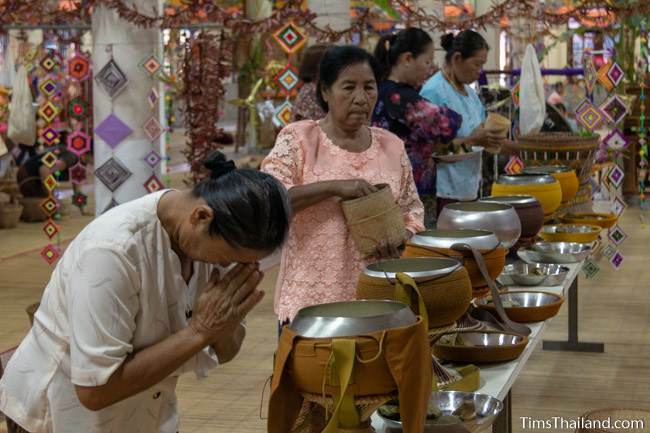 The final Boon Pha Wet activity, listening to the entire Vessantara Jataka tale, began at 10am and about seventy-five people came – few under age sixty. 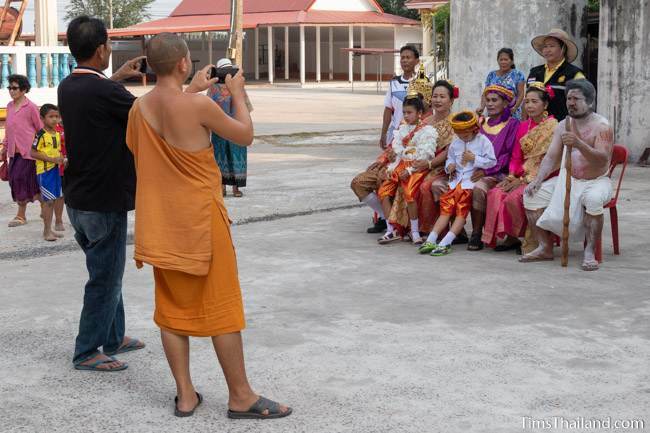 The storytellers were a three-monk team from Maha Sarakham that specializes in Boon Pha Wet ceremonies. 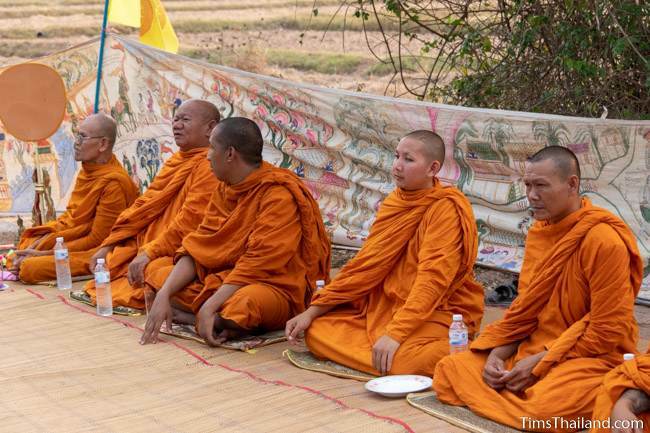 Each monk played several characters and knew their parts by memory. 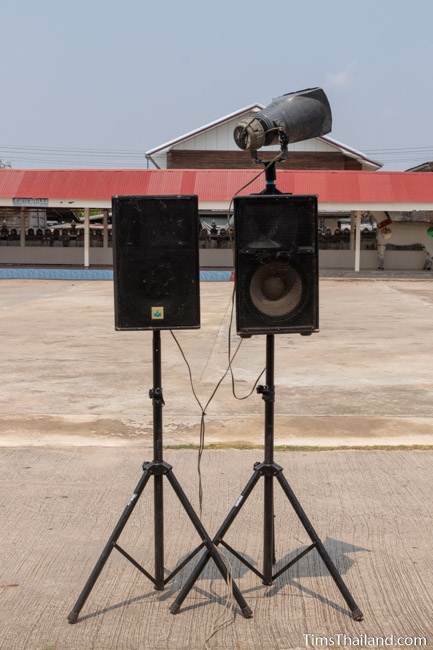 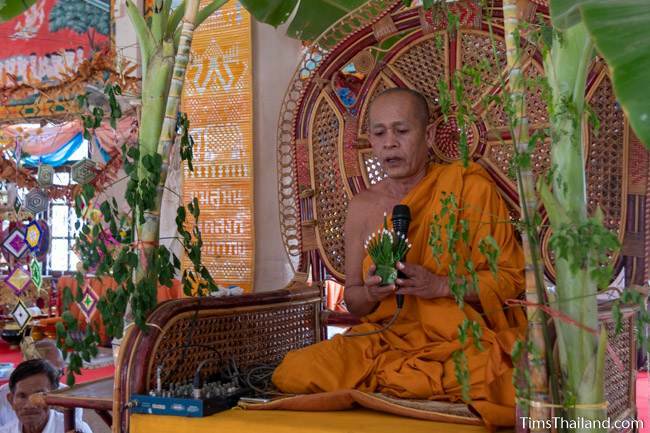 Told entirely in the Isan language, and broadcast out to the village via loudspeaker, these monks' informal version of the tale took considerable creative license to make it their own. 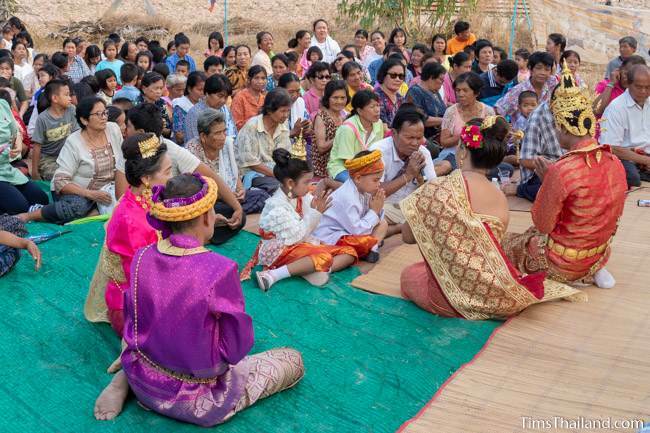 When Jujaka was searching for Prince Vessantara, for example, he travelled to Yasothon, Loei, Chumpae, and other places in Isan before finding him here in little Ban Lan – which got a great laugh from the audience. 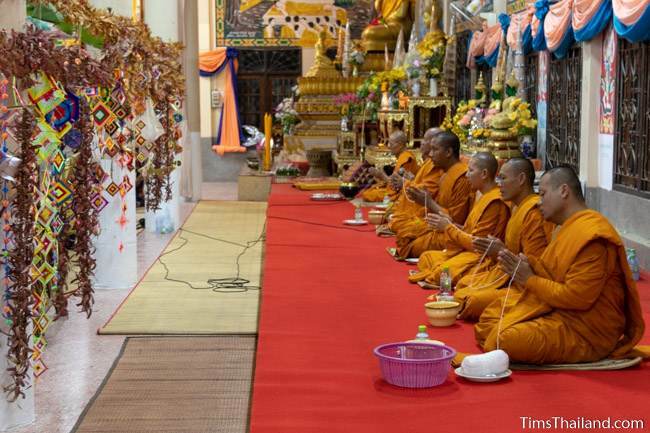 One monk also suggested a lucky lottery number for the upcoming draw. 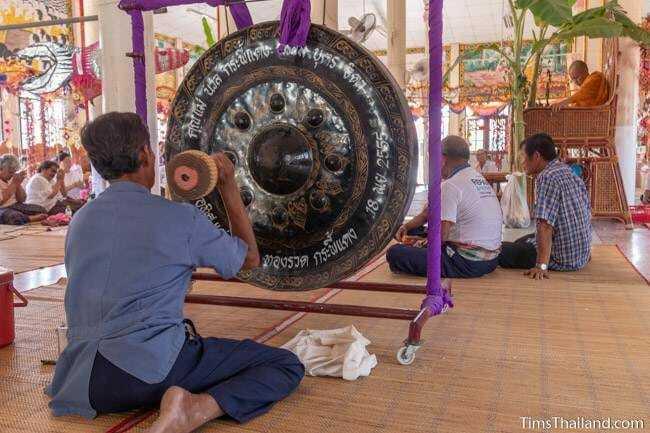 Each chapter began with candles being lit and ended with three strokes of a gong. 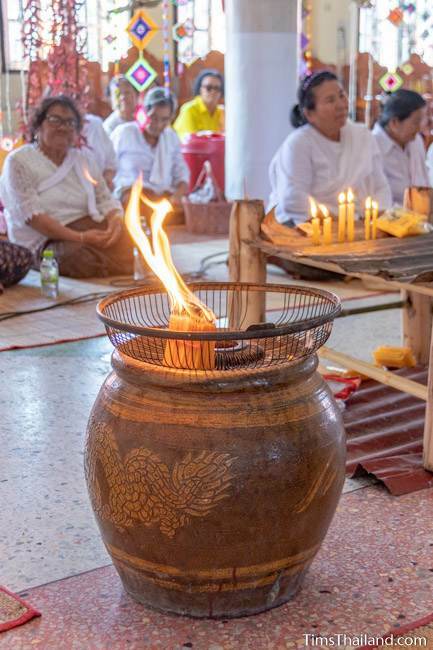 Besides the one thousand candles for the Phra Malai story (these were burned as bundles, creating some big flames) mentioned above, several of the chapters had a sponsor who donated money to the temple for the festival, and they each lit a pair of candles on a table. 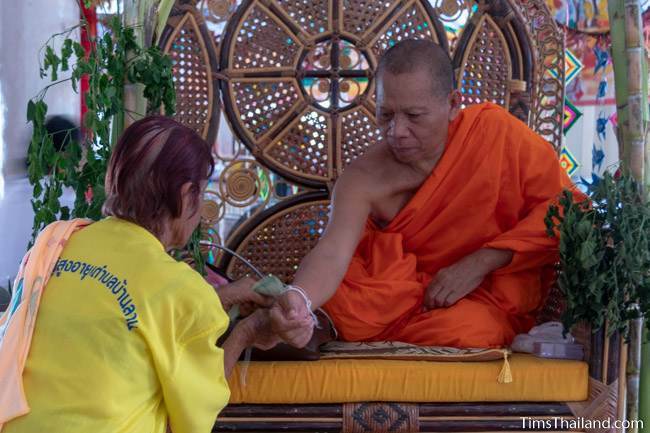 Many people made twenty-baht donations to the monks during parts of the story they considered auspicious. 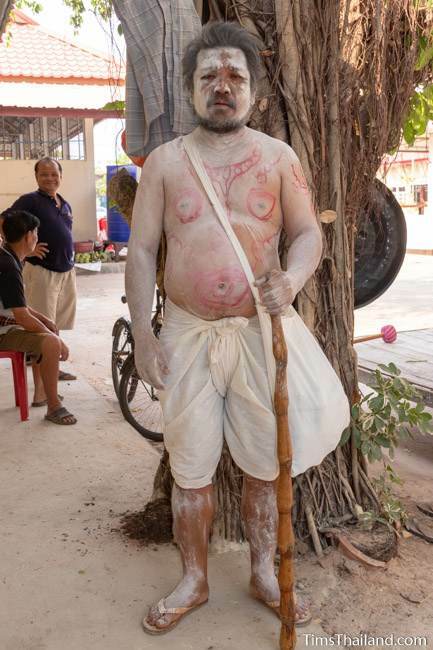 By far the most popular of these was when Jujaka was looking for Prince Vessantara. 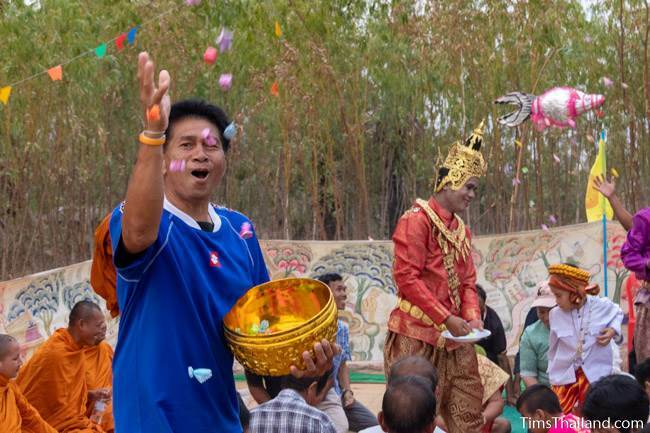 As he journeyed across Isan he begged people for money, so much of the audience got up to give him some. 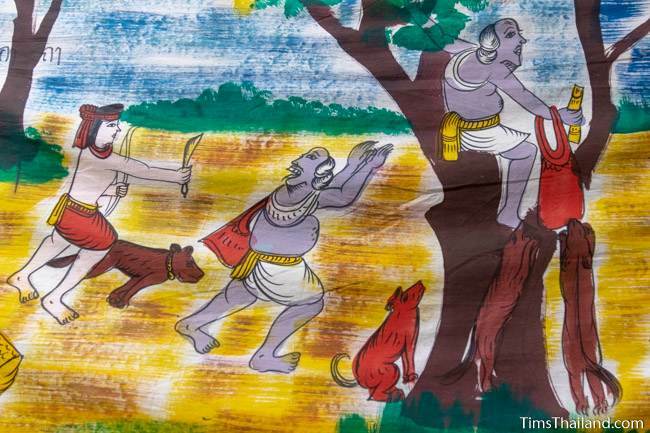 And when Prince Vessantara's wife came home and found out that he had given their children away as slaves to Jujaka, she fainted in distress. 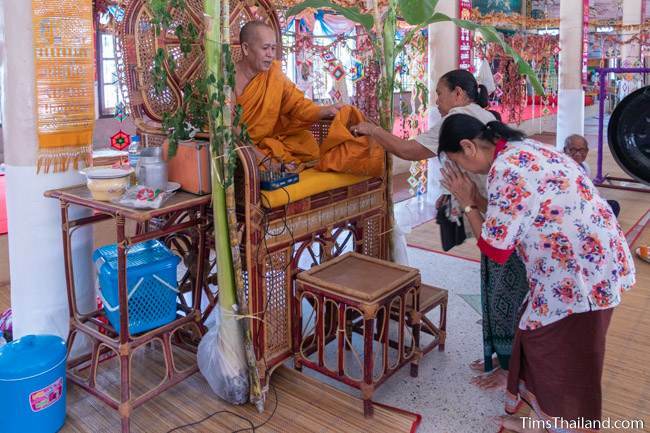 At this point several women went and tied sai sin (sacred white threads) around the monks' wrists (some just gave the thread to the monk and let him tie it himself) since sai sin have healing power. 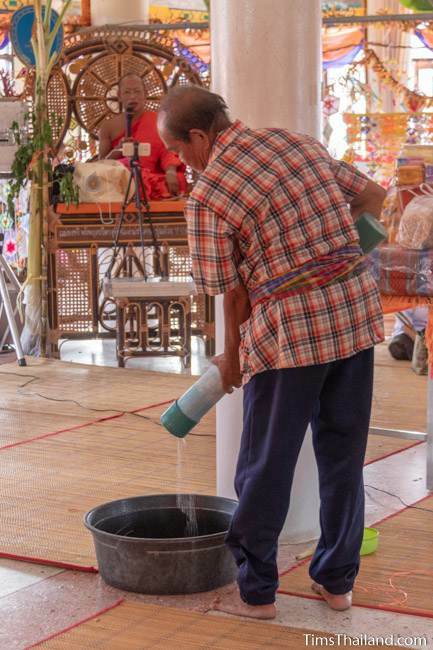 And near the end of the story, when Indra sends rain to revive everyone, a man poured water into a bucket to, like the day before, encourage plenty of rain in the coming year. 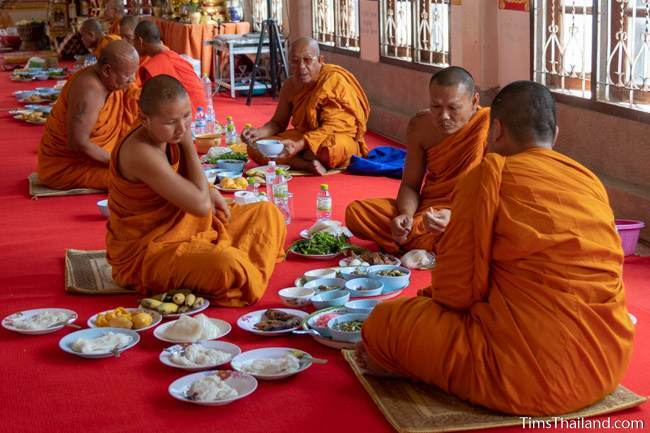 After the story was finished (their slightly abbreviated version of the story took about four hours, not counting their lunch break), the monks blessed the congregation with hope that everything will be good in their lives now and that they will be reborn in the time of Maitreya. 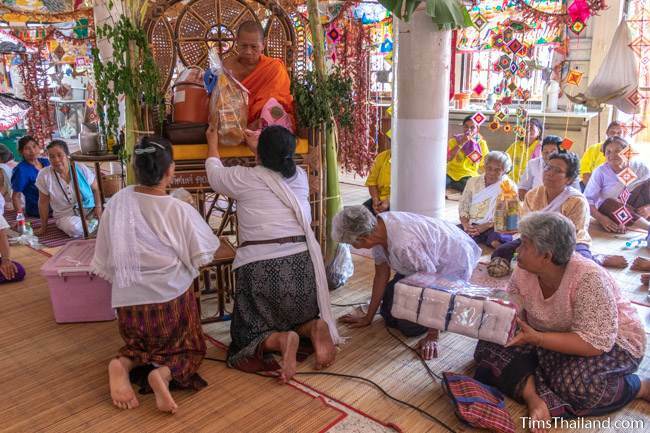 After some final chants and prayers people gave the monks useful things like pillows, sandals, toothpaste, tea, matches, and money. 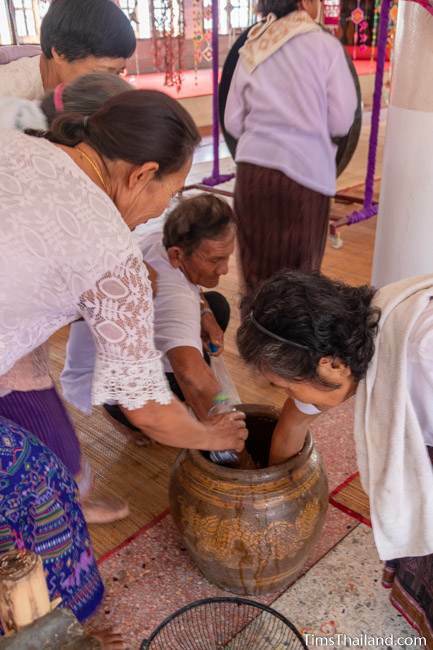 Before heading home, most people filled a bottle with what was now holy water from the large-clay pot that the melted candle wax had dripped into. 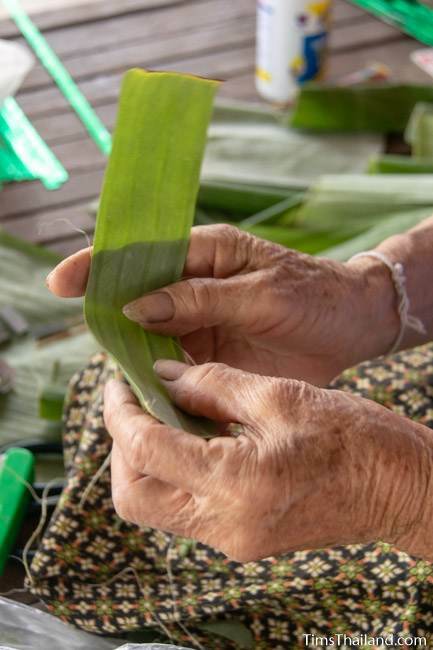 At home they would do something special with it, such as bathe with it or pour some over their children; whatever they felt would bring some good fortune. 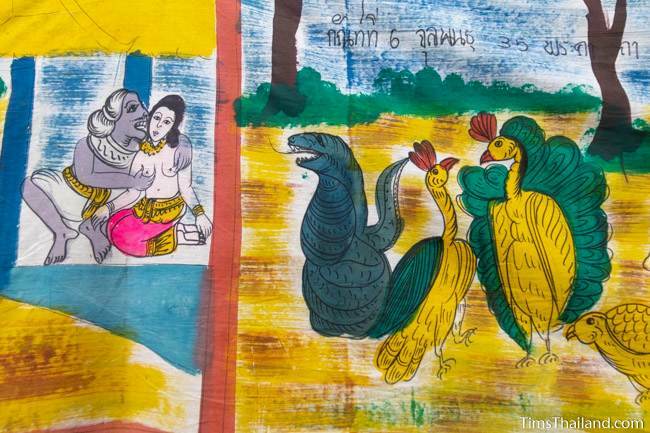 Pha Wet banner painted in 1963. 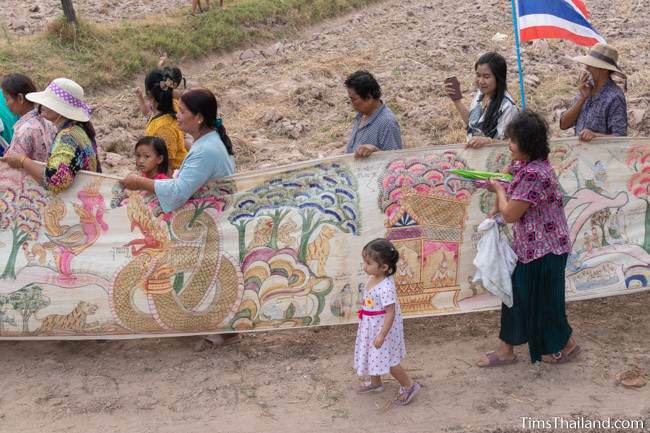 Pha Wet banner painted around 2013.